Prof. Montserrat Diéguez studied chemistry at the Rovira i VirgiliUniversity in Tarragona (Spain), where she received her Ph.D. in 1997 working in the group of Prof. C. Claver. After she moved to the Yale University as postdoctoral fellow with Prof. R.H. Crabtree, in New Haven (USA). She returned to Tarragona in 1999 and accepted a lecturer position at the University Rovira i Virgili, becoming part of the permanent staff in 2002. 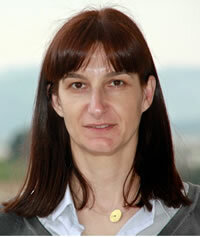 In 2011 she was promoted to full Professor in Inorganic Chemistry at the University Rovira I Virgili in Tarragona. She has been involved in more than 40 research projects in the field of organometallic chemistry, steroselective synthesis, asymmetric catalysis and metalloenzymes. She is author of more than 130 articles in SCI indexed Journals, book chapters and books and of several contributions to Conferences. She obtained the Distinction from the Generalitat de Catalunya for the promotion of University Research in 2004 and the Grant for Research Intensification from URV in 2008. She has been awarded the ICREA Academia Prize 2009 and 2015 from the Catalan Institution for Research and Advanced Studies.